I only have one Demon in the stash! 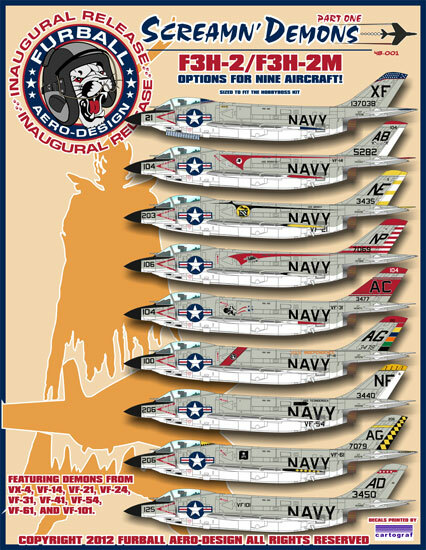 Excellent decals for an iconic Cold War fighter that served during perhaps the most colorful period of naval aviation. “What in the heck is “Furball?” you may be asking yourself about now. 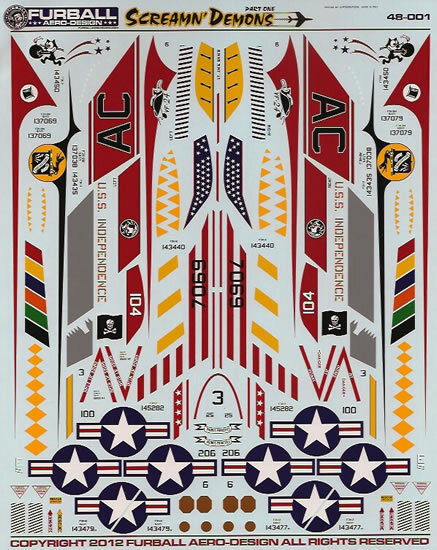 Geoff Martin has been the primary artist for Afterburner Decals forever and is branching out on his own with this initial sheet of Demon markings. So, if you like Afterburner decals, I think you’re going to like these. See the “Price” box above for ordering and payment information. 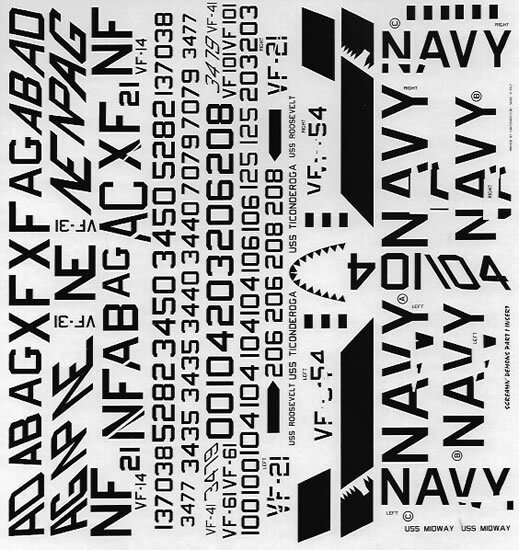 As you can see from the included images, this offering includes two Cartograf-printed decal sheets—one 8”x10” sheet with color markings and a 7.5” x 8” sheet with black markings. 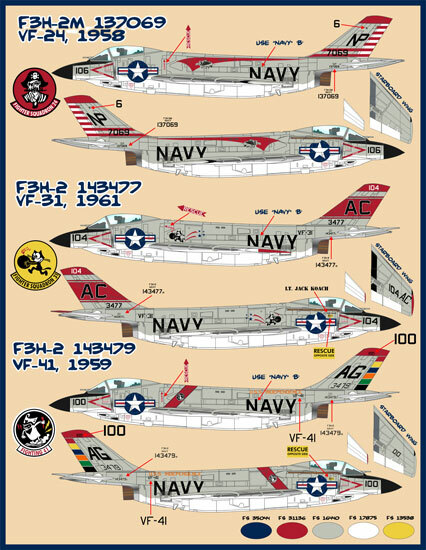 There are enough “standard” markings to do two complete aircraft with squadron specific markings for nine jets: three F3H-2M interceptors (VX-4 test, VF-24 east coast and VF-61 west coast) and six new-build F3H-2s (four east coast and two west coast). 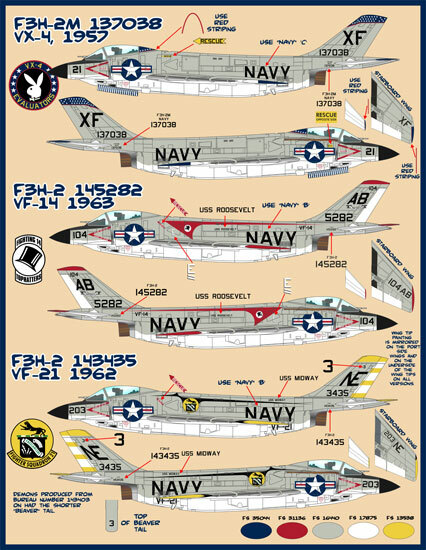 To clarify the somewhat confusing Demon designations: 142 F3H-2Ns (F-3C) and 80 AAM-N-2 (AIM-7A) Sparrow I-armed F3H-2Ms (MF-3B) were produced in parallel. They were followed by 239 AAM-N-6 (AIM-7C) Sparrow III-capable F3H-2s (F-3B). The F3H-2N and F3H-2 had six underwing pylons capable of carrying a number of different stores; the F3H-2M had only four underwing pylons, omitting the center one. The F3H-2 could be most easily identified by its shorter “beavertail”. All Demons were built with four Mk 12 20mm cannons, but usually the upper pair were removed and faired over. When AAM-N-7A (AIM-9B) Sidewinders became available, all Demons were modified to employ them. Demons could also be fitted with up to two external fuel tanks, which added virtually no performance benefits and were almost never used (and if used, only one was carried). Many of the F3H-2Ns (but none of the F3H-2Ms) were eventually upgraded to F3H-2 standards. During the 1960s, many F3H-2s were fitted with Martin Baker H5 ejection seats. This sheet is sized to fit the new Hobby Boss kit. However, after making a copy and checking against my A-Z kit, I don’t believe there will be any problem using them on the old Golden Dragon and A-Z releases. 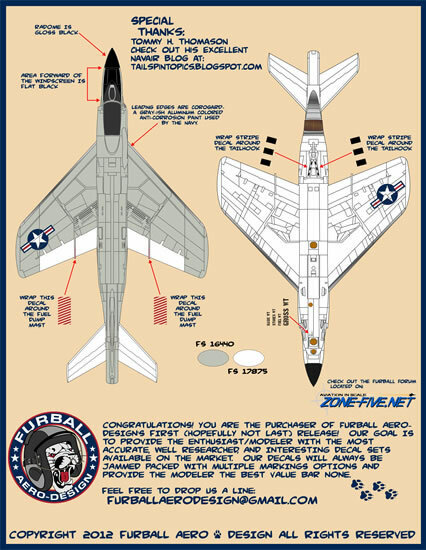 It’s also worth noting that the decals are separated where appropriate (e.g., the fuselage “NAVY” markings -- to allow the speed brakes to be opened, the upper wing national insignia -- for the wing fence, etc.). 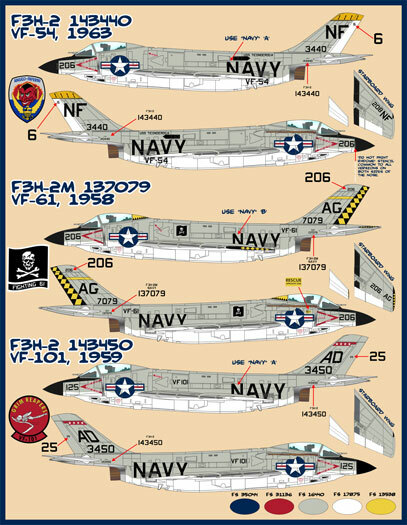 As an aside, photographs of all but one of the subjects on this sheet (VF-31 being the exception) can be found in Steve Ginter’s McDonnell F3H Demon (Naval Fighters Series Vol. 12), which will drive up the price of your build a bit, but also give you a lot of insight into the Demon and its operational history. Two other useful references are Jim Mesko’s Squadron In Action 140 and Tommy Thomason’s U.S. Naval Air Superiority. I could prattle on telling you a bit about each of the jets on this sheet, but let’s be real. The Demon was a Cold War fighter that saw no combat (first entering squadron service with VF-14 in April 1956, and exiting with VF-161’s retirement of the type in September 1964). If you like this jet, the primary discriminator is going to be which set of markings spark your interest. For that you can make up your own mind from the included images. Thanks to Furball for the sample.